5. Strengthening disaster preparedness for effective responses at all levels. Because climate change is increasing the frequency and/or intensity of weather-related hazards for many communities, DRR is central to supporting many communities to adapt to climate change. However, not all DRR is about climate-related hazards (other hazards include earthquakes) and, equally, not all climate change impacts are hazards (such as saline intrusion exacerbated by rising sea levels, increasing temperature, unpredictable rainfall patterns, and changing seasons, all of which are more long-term, insidious, changes). 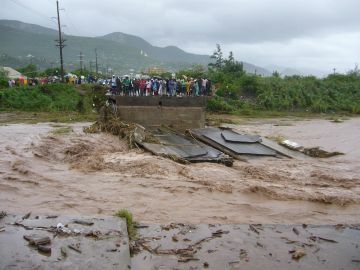 There are also some areas where hazards won’t change (or may even decrease in frequency or intensity), such as flooding on the Zambezi in Mozambique. Making DRR relevant to climate change means that the way that climate change alters hazards must be understood and incorporated into programme design. For example, if it is known that climate change is likely to increase the severity of flooding threefold (so, for example, a ‘once-in-50-years flood’ will happen every 16 or 17 years), then the design of flood shelters (etc.) should take this into account. Where such precise climate change predictions are unavailable, then a ‘precautionary’ approach can be taken; in other words, look at the most severe climate change prediction and base programming decisions on that.